In the elegant sculpture court of Edinburgh College of Art, the third year students had chosen the usual eclectic range of media and subject for the Third Year Exhibition. 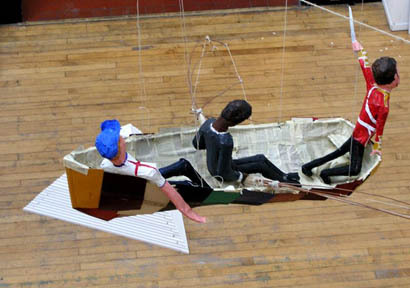 Flying high in the air above video installations, a provocatively placed eighteenth century style slipper, a box with a hand escaping over the edge, Luke Fletcher’s exhibit evoked a colourful cartoon such as Hergé’s Adventures of Tintin. In a craft made entirely of old books culled from Sam Burns’ junkyard in Prestonpans, Three Men in a Boat sailed in their craft of words to an uncertain future. Photo © Chris Hill 2006.